MEDITATION CHIME: Enjoy the long and clear "ping" from the percussion hammer and metal tube that gives you a perfect calmness sound for meditation moments. ATTENTION GETTER: This classroom chime is a smart management tool for teachers. Effective way to focus and redirect attention in a children classroom or a yoga class. MINDFULNESS CHIME: The solo-tone zenergy chime is a suitable percussion instrument that relaxes and re-energizes your mind. A great zen meditation chime! ZEN CHIME: Simple way to clear any negative energy in your home with the solo tone chime that creates a positive flow. Spread good vibes wherever you go! 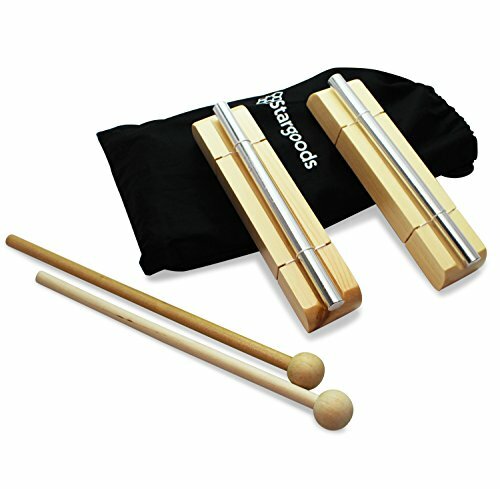 GREAT GIFT: These percussion chimes are a nice and classy musical set to give as a gift to any music lover. Great wooden energy chimes for kids and adults use.  MEDITATION CHIME: Enjoy the long and clear "ping" from the percussion hammer and metal tube that gives you a perfect calmness sound for meditation moments. ‍ ATTENTION GETTER: This classroom chime is a smart management tool for teachers. Effective way to focus and redirect attention in a children classroom or a yoga class.  MINDFULNESS CHIME: The solo-tone zenergy chime is a suitable percussion instrument that relaxes and re-energizes your mind. A great zen meditation chime!  ZEN CHIME: Simple way to clear any negative energy in your home with the solo tone chime that creates a positive flow. Spread good vibes wherever you go!  GREAT GIFT: These percussion chimes are a nice and classy musical set to give as a gift to any music lover. Great wooden energy chimes for kids and adults use. If you have any questions about this product by Stargoods, contact us by completing and submitting the form below. If you are looking for a specif part number, please include it with your message.